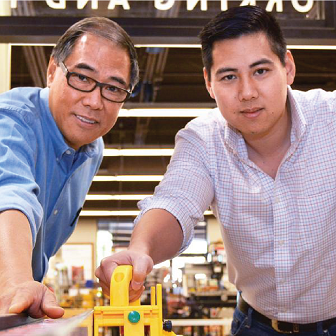 Bruce Wang, CEO of Micro Jig, which is a GrowFL 2017 Florida Companies to Watch honoree, has been immersed in entrepreneurship since he was a child. Now, his company is on a mission to end table saw injuries around the world. "I always had an entrepreneurial background since was young selling lemonade," he said. "I studied business in college and continue to study it to this day. About a year after graduation, I became CEO of a group collaboration software company called Grouptable and I founded a nonprofit called One Brick Orlando. My father founded Micro Jig and I grew up in this company. Over time, I took on more and more responsibility and grew the vision of what we could accomplish. Grouptable was eventually acquired, I continued to focus my efforts on scaling up Micro Jig." Micro Jig designs, develops and distributes innovative consumer tools primarily for makers, craftsmen, woodworkers, DIYers, and professionals. "We design truly unique and innovative tools and products that are an order of magnitude better than the closest substitute," Wang explained. "People use our products on table saws and powertools to protect their hands, prevent kickback and control their work material with far greater precision and control than any other product." Wang is grateful for the recognition as a GrowFL Florida Company To Watch and all GrowFL does for Florida businesses. "It's an honor," he said. "It's exciting to be recognized and participate in the community that we care about and to have a chance to connect with and work with some of the top companies in the arena." Wang's advice for aspiring entrepreneurs is threefold. "One is know what it is you really want out of the enterprise and your life and what is the change you're trying to create in the world," he said. "Two is be relentless, persevere and persist. If you're willing to work harder and smarter then there is no dream out of range of attainment. Three surround yourself with amazing people who push you to be better and are there to support you in work and emotionally and spiritually throughout the undoubtedly tumultuous journey that entrepreneurship is."